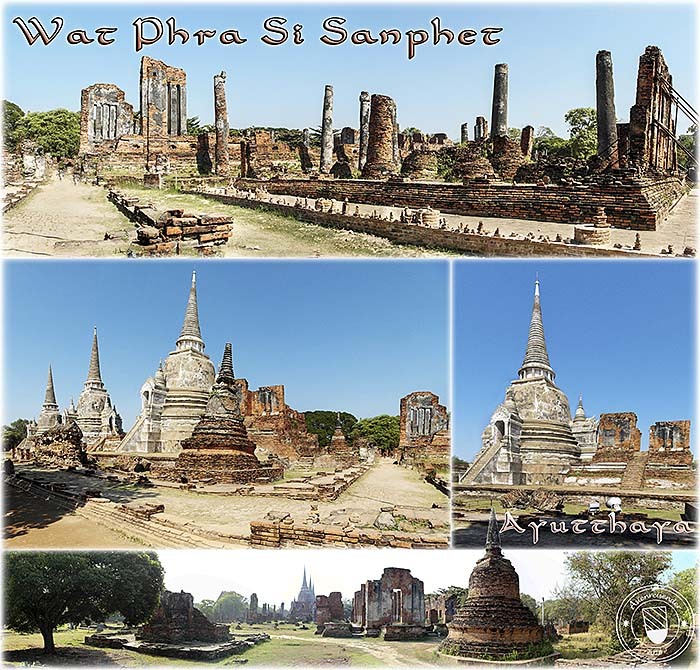 For a 'Map of Ayutthaya Historical Park' click the link or the image. 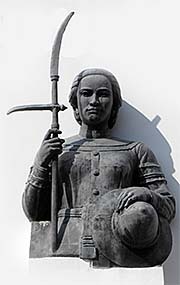 16th century queen Sri Suriyothai, allegedly fallen in battle in 1548 CE to save her husband from death. 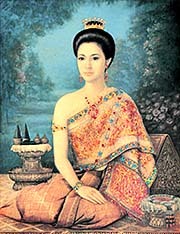 Though, the story is historically not confirmed, for the Burmese records do not mention queen Suriyothai a single time, although she has been killed by the Burmese king. The king, however, didn't know he was fighting against a woman. 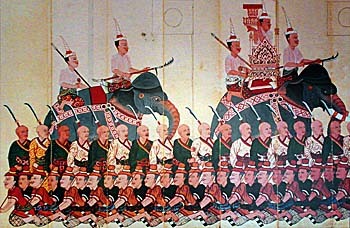 Queen Suriyothai was disguised as a Siamese elephant warrior. According to the Thai records she fell together with her daughter in that elephant battle. A Thai movie, 'The Legend of Suriyothai', is based on this story. 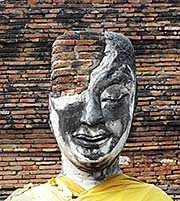 Image by Asienreisender, at the Suriyothai Memorial Chedi in Ayutthaya, 2012. 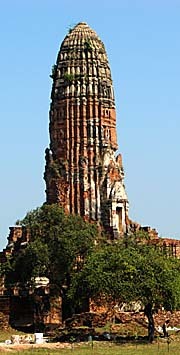 The kingdom of Ayutthaya was one of the great empires of Southeast Asia in the late middle-ages until early modern times. It spanned the historical time between it's founding year 1351 CE to it's destruction in 1767 CE. Ayutthaya was, in terms of imperial dominance, administration and culture the successor of the classical Khmer empire of Angkor. An army from Ayutthaya besieged and sacked Angkor Thom in 1431/32. From then on Angkor, which was in a process of decline anyway, sunk into meaninglessness and it's huge city in central Cambodia was practically forgotten for centuries. After the conquest of Angkor Thom, many skilled specialists were brought from Cambodia to Ayutthaya, influencing the newly emerged great Indochinese power deeply. Ayutthaya was in the 17th century described by Asian as well as Western visitors as one of the most meaningful places in the world. French envoys as Simon de la Loubere, (who visited Siam's capital in 1687/88), compared Ayutthaya with the contemporary Paris in wealth, political power and cultural influence. 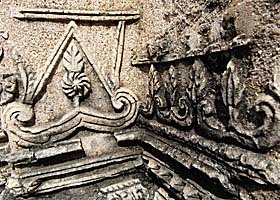 Nowadays Thailand is grown out of mixed influences from the first Tai tribes, coming from the south of China, the early Mon cultures in the north and center of Thailands contemporary geography, the great Khmer culture of Angkor and a lot of Western input since the midst of the 19th century. At the site of Ayutthaya was at first an old trade post on a trade route between India and China, long before Ayutthaya as a city state was founded. This post was certainly maintained by Mon People of the Dvaravati Culture. Later, in the 12th century, the place was overtaken after the conquest by the empire of Angkor. 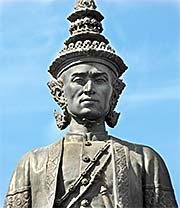 As the founder of the medieval Siamese Ayutthaya, king Ramathibodi I (formerly: U Thong), is known. Ayutthaya became quickly a very important trade hub and political power in Southeast Asia, coined it's history significantly over the coming 416 years. 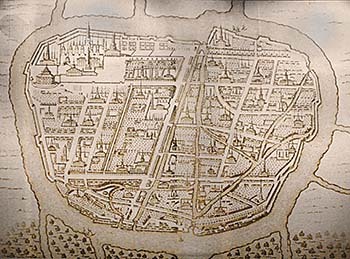 The city grew as big as up to a million inhabitants in around 1700. In the mid 18th century it was eventually sacked and totally destroyed by an army of an aggressive Burmese kingdom, Pegu. Ayutthaya, although it was a city-state comparable with Athens or Sparta in the old greek world, expanded and controlled a number of other city-states of it's time. Among Ayutthaya's early competitors was the legendary Khmer empire of Angkor, which lost power and influence in the 14th century and was sacked eventually by Siamese troops from Ayutthaya in 1431/32, as mentioned above. Ayutthaya became the hub of the land trade routes of Southeast Asia, means all the trade between China and India and down to Malacca in Malaya. It tried to expand it's control even over Malacca in the 15th century, attacking it twice, once with a fleet and a few years later with a land army. Both attempts failed. Nevertheless, it remained an Southeast Asian center of trade with China, Annam (nowadays Vietnam), India, Japan and Persia. After the first Europeans (namely the Portuguese who first arrived in Ayutthaya in 1509) came to Southeast Asia, the trade also expanded with the European powers Portugal, Spain, the Netherlands (respectively the VOC, the Dutch East India Company), France and England. Ayutthaya was later the political and cultural model for the re-foundation of the kingdom of Siam with the capital of Bangkok (Krung Theb) from 1782 on. This succeeding kingdom of Siam developed into modern Thailand as we know it today (Rattanakosin Era). 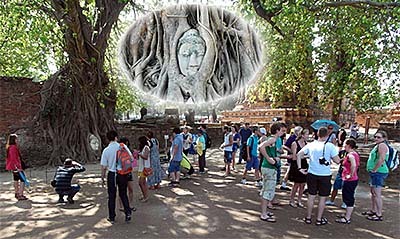 Much of what we see of tradition in nowadays Thailand roots in the old, medieval and early-modern Ayutthaya. 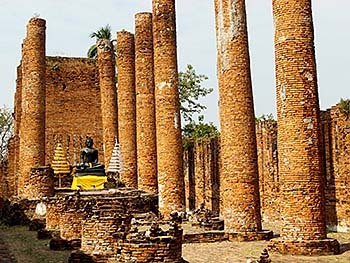 Apart from Ayutthaya Archaeological Park, who covers the site of the old city, a new Ayutthaya has been founded closely east of the old place. 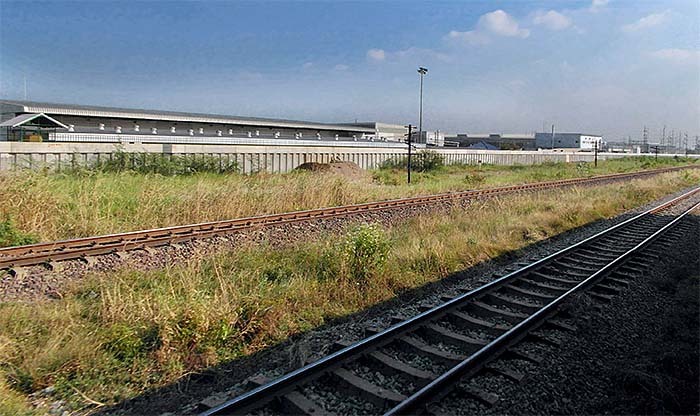 The new city, however, is growing and diffusing into the grounds of the old site. 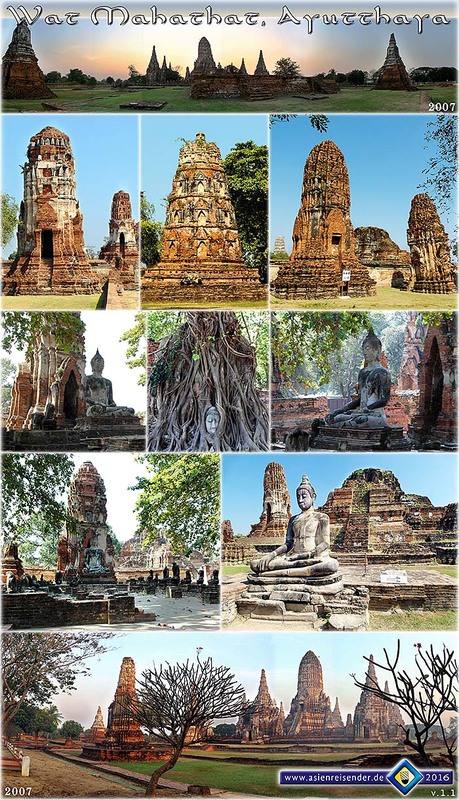 Ayutthaya Historical Park is listed as UNESCO World Cultural Heritage since 1991. A first restoration period happened already in the years 1854 - 1868. 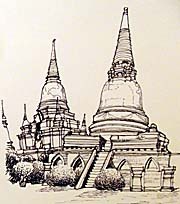 After the declaration as world heritage, the Thai Fine Arts Department developed a master plan for further restoration. The territory of the heritage covers 289 hectares. The geography of Southeast Asia is coined by long mountain chains who are the southernmost extensions of the Tibetian Himalaya Mountains. These mountain chains align in north-south directions. They are rich in water, streams and rivers in a great number come out of them and form bigger rivers. The biggest neighbour river west of the huge Mekong River is the Chao Phraya, who coines Thailand's central alluvial plains and makes the country so rich for agriculture. At the lower Chao Phraya River, where it is joined by the Lopburi River and the smaller Pasak River, Ayutthaya is surrounded by the three rivers and placed inmiddle of an extensive canal system, being an island. After the founding of Ayutthaya a canal was built in the north-east of the place, to complete the island status of the new town and city-state. 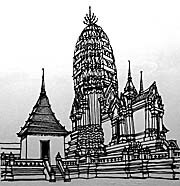 At it's founding time in the 14th century, the place was situated closely to the shores of the Gulf of Thailand. Due to silt sedimentation, the coastline is nowadays about 100km farther south. The distance to Bangkok is about 70km. An interesting observation in Ayutthaya is, that there is nothing left of places where people lived. I mean normal people, not the one's who are content of the historical records and end up in the history books. That's everywhere so in Southeast Asia's ancient places. Where the people lived, that's all gone, because it was built with wood, bamboo or other materials with a short live span. Stones where only used for temples, city walls and fortresses. Here in Ayutthaya, in difference to a place like Angkor, the stone-built buildings were built with clay bricks. Red, burned bricks. There are no mountains around Ayutthaya, there are no quarries around here; it's situated in the central plains of Thailand, in the lower Chao Phraya River area. I didn't see many buildings or artefacts built not of bricks. The material for the exceptions must have brought from further away, from the north or west, probably on boats. While the surrounding rivers and the new canal where usable as transport routes for ships, the Siamese built more canals (klongs) on the island, to extend the transport system. It's a traditional Siamese/Thai skill to create sophisticated canal systems. The canals on Ayutthaya Island were built in a chessboard pattern. 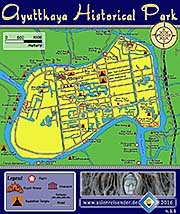 Ayutthaya was in fact, as well as Angkor, a hydraulic city, respectively a hydraulic civilization. 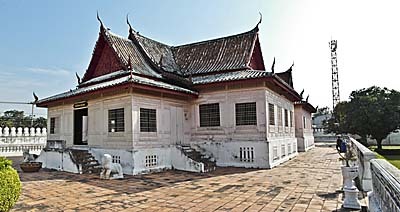 At the northeast of the island was 'Wang Luang' built, the royal palace. From there a broad, representative boulevard, Thanon Pa Thong ('Street of the Golden Forest') passed off to the south, ending at the southern part of the city wall, which surrounded the whole island. In these times it was probably a very pleasant walk up and down in all-day, when there where no big representative happenings. Quiet and peaceful. No cars, and that's something so phantastic, that a modern man can barely imagine how precious a world without cars would be. One could walk in silence without being terrorized every moment, threatened to be hurt or killed by a big iron vehicle which produces smog and an awful din. Nowadays it's exactly that bad, as I noticed driving nowadays Thanon Khlong Makhamriang from south to north on a bicycle. Impossible to enjoy the surroundings. Watch out for traffic! A grid of streets in old Ayutthaya was as well aligned in a chessboard pattern. 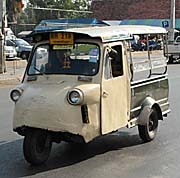 A number of streets crossed 'Thanon Pa Thong' in east-west direction. One of them passed the temple of Wat Mahathat and continued to the market quarter, where goods were sold and workshops are running. Shops seamed the sideroads. The most houses were placed along the canals, not the streets. The people used boats for transport, for there were few means of transport for streets available. 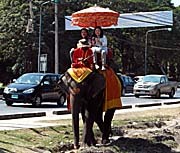 Horses are not common in Southeast Asia, and elephants were not available for everybody. At the surrounding waterways were frequently ferry stops placed. It's probably comparable with the ferry system of nowadays Bangkok, where there is a public ferry transport on the Chao Phraya River. Entering the city was possible by passing through one of the twenty watergates. The canals were the main mean of transportation. They were bridged by a great number of brick-built bridges. Simon de la Loubere described them in his 'Depiction of the Kingdom of Siam'. One bridge was a drawbridge, it's said it was build after a Dutch model. An annual barge procession was held in November. The king of Ayutthaya had the biggest barge, a golden one; it was followed by a number of other golden barges. This event is the predecessor of a long tradition of this kind up to the 'royal barge procession' which is still held unfrequently in Bangkok nowadays. The procession was accompanied by traditional Thai music. 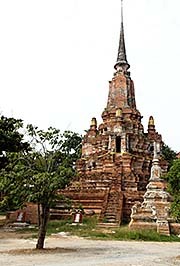 In the first time Ayutthaya was surrounded by a mound which run parallel to the surrounding rivers. Later a brick-built city-wall was erected who could stand the Burmese cannons (the shells in this time weren't explosives, but iron balls only). The city-wall was equipped with 17 watch-towers and 75 guarded gates. In monsoon time the Ayutthayans were able to flood the surrounding land what made it impossible for an enemy army to siege the city much longer. That was a major reason for the retreat of the Burmese army from Pegu in the Burmese-Siamese War of 1548/49. The surroundings of Ayutthaya are very much urbanised. It's growing together with greater Bangkok, which is only 60 kilometers away. There is a significant industrial fat belt particularly south of Ayutthaya, where a lot of high-tech industries are active. Japanese, Korean, German electrotechnical industries produce here for the world market. The 2011 flood affected particularly this area and led to a shortage of hard disk drives worldwide. A significant number of computer part industries of the world is located here in the lower Chao Phraya Plains. 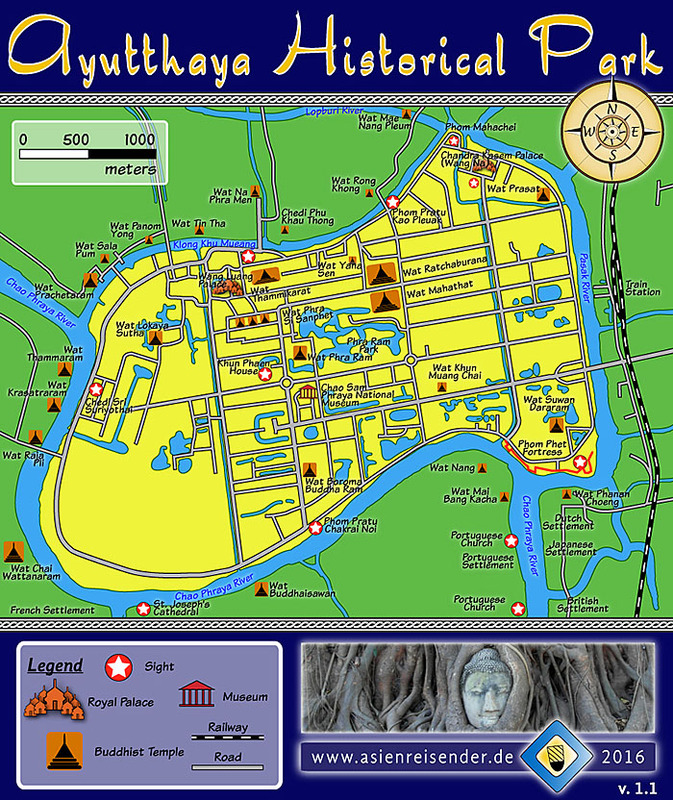 Around the time of the foundation of Ayutthaya the political map of central and north Thailand was divided between a number of ancient city-states. There was Lanna with the capital Chiang Mai, there was the double-kingdom of Sukothai and Si Satchanalai, Lavo (nowadays: Lopburi), not far away from Ayutthaya, the 700 years old Mon kingdom of Hariphunchai (nowadays: Lamphun, see: The Dvaravati Culture), 1292 CE captured by Lanna, Lan Chang (the land of the million elephants, nowadays in north Laos) and some others. East of Ayutthaya, in the Cambodian plains, was the legendary Khmer empire with it's capital Angkor, ruling since centuries already as a dominant power in Indochina. To the east, central Thailand is divided from Burma through a high and long mountain chain with only very few passes (see: 'The Three Pagodas Pass' and the 'Tenasserim Mountains'). In the mid 14th century there was yet no clear border between Siamese and Burmese kingdoms. They were separated by uninhabited mountain chains. 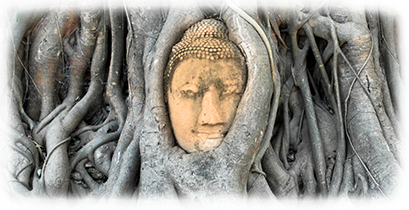 Ayutthaya was founded in 1351 CE by a local leader named U Thong and his Tai followers. The name of the new settlement refers to the capital 'Ayodhya' in the Indian epos Ramayana. U Thong changed his name into Ramathibodi and gained control over the neighbouring city-states. For me it's not fully clear where Ramathibodi and the Ayutthayans gained their resources from, but the expansion of the new empire went on quickly. 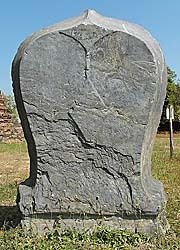 Although Lovu/Lopburi was under Khmer rule at the time, it was one of the sources of power of newly founded Ayutthaya. 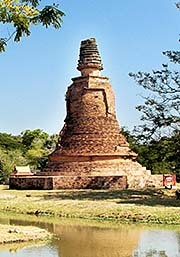 In 1438 Ayutthaya incorporated Sukothai due to a dynastic change. The long-lasting military conflict with the eastern great empire of Angkor was decided to the favour of Ayutthaya. There are indications, but no real historical evidence, that in 1369 already Angkor Thom was sacked for the first time by the Ayutthayans. The big war of 1431/32 sealed Angkor's final defeat, it was sacked (again) by a Siamese army, led by king Borommaracha II, and became abandoned afterwards (the Khmer capital was moved then to Phnom Penh). Angkor sank almost in complete oblivion for centuries. The Siamese brought many slaves, qualified specialists and other resources back to Ayutthaya, what was furthermore strengthening the young, upcoming power. 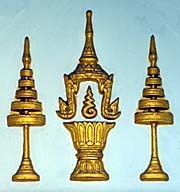 Much of the Khmer cultur was adapted into the developing Siamese culture. The concept, that the king is a devaraja and a Boddhisatva, an enlightened kind or godking, who delays reaching nirvana in favour for the people among which he lives, comes from Angkor. 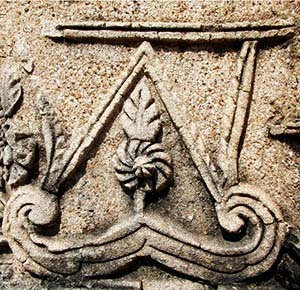 The administrative model of Angkor was applied in a larger degree in Ayutthaya. Also the famous Thai dancing style originates in the older Khmer dancing, as it is to see originally in many frescos in Angkor Wat. 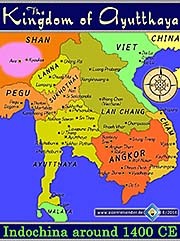 Ayutthaya was the first Siamese empire which also expanded deep into the Malay Peninsula (mid 15th century). A number of Malay states subdued to the Siamese, with the exception of the most important, Malacca. Malacca was supported by China (Ming Dynasty), and the Chinese used it as an important trade base. The Chinese had a strong interest not to loose the coastal city and contributed military effords to defend it against potential conquerers. Malacca managed to defend two Siamese attacks and remained independent until it was conquered by the Portuguese under Afonso de Albuquerque in 1511. Though, in the rivaltry between Malacca and Ayutthaya, the latter controlled the Isthmus of Kra, the seaport of Mergui and the whole Andaman Coast, of which the large northern part is Burmese nowadays. The Malays in Malacca and other sultanates south of Nakhon Si Thammarat converted from 1430 on step by step to Islam, what gave them a strong religious identity, contrasting the Siamese. 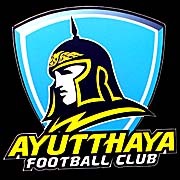 Ayutthaya faced also a rivaltry against it's northern neighbour Lanna, which it couldn't gain control over. Lanna itself showed ambitions to take over territories controlled by Ayutthaya, what caused king Borommatrailokanat (short: Trilok) to change his residence to Phitsanulok in 1463 (until 1488), probably to be closer to the northern front. Here we see, in comparison to the situation in Indochina around 1300 CE, that the Tai / Thai / Siamese are expanding more to the east. The empire of Angkor is in sharp decline already and will lose it's dominance over the world region in the midst of the 15th century. Also remarkable is the expansion of Annamese / Vietnamese People southwards into Champa territory. Despite to the huge territorial expansion, Ayutthaya wasn't a firm and stable territorial state. Most of the conquered places where vassals, but maintained their own administration and military. Sometimes vassals even led war against each other. It's very remarkable that mighty Ayutthaya itself sent tributes to the Chinese emperor (see: Ruangslip, Bhawan - Dutch East India Merchants look on Ayutthaya). The high nobility was always ambitious of taking the throne over, especially when a king died. Then different fractions of noble elities gathered troops and marched towards Ayutthaya city, to force their favorite successor on the throne. Ayutthaya has a long record of internal struggles for power, it's not said too much that throne successions often happened in a kind of 'Tudor style'. 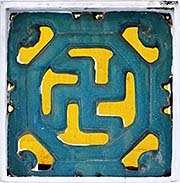 Buddhism was used as an ideological mean of legitimation and strengthening the power of the king. 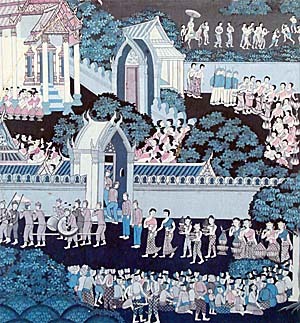 A system, called 'sakdina' (see below) was invited by king Borommatrailokkanat (1448–88), forcing every subject in the state of a certain role in it. Still today sakdina is shaping Thai society, making anyone different in a clearly defined role. Even twins are unequal insofar as the first born stands above the second born in rank. It enabled the central power to deploy people into workforces or into the military, just as the king wished it. This powerful implementation made Ayutthaya the most efficient state in the Southeast Asia of it's time. In the 16th century, Ayutthaya was shook by heavy internal fights, while in neighbouring Burma a dynasty erected the new empire of Pegu. It came in 1538 to the first of a number of Burmese invasions into Siamese controlled territory. The Burmese could be defeated, but they came back in 1548/49, laying siege on Ayutthaya. In this war the legendary 'loss of Queen Suriyothai' happened (it's not sure, if Suriyothai was a real living historical person or a legend, for she does not appear in any Burmese record). 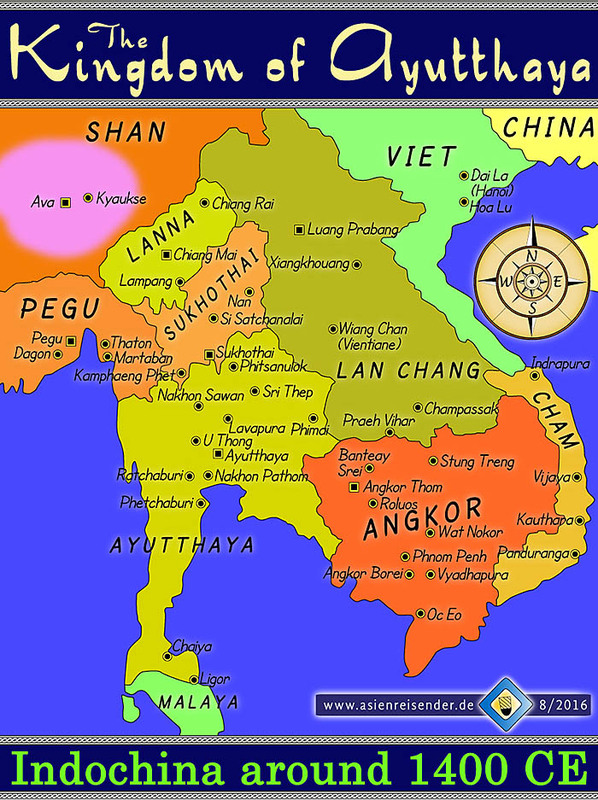 In 1557/58 the Burmese conquered Lanna, threatening Ayutthaya now from it's northern border as well as from the west. 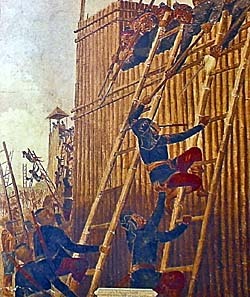 In 1563 another big attack was launched, on which Ayutthaya wasn't sufficiently prepared. It became a Burmese vassal. Trying to get rid of the Burmese rule led even to the military conquest of Ayutthaya (supposedly due to treachery) in 1569. From 1590 on the Siamese were able to free themselves from the Burmese rule under king Naresuan (called subsequently 'the great'). Naresuan reestablished the kingdom of Ayutthaya in it's former borders. He even expanded Siamese controlled territory over the old borders into south Burma. In the east he conquered Lovek, what was for a time a Cambodian capital after Angkor Thom was abandoned. 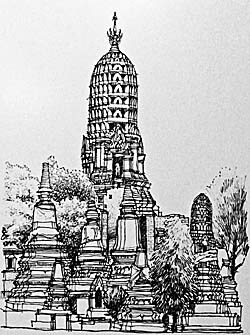 A considerable number of Khmer prisoners and slaves were brought to Ayutthaya. The Portuguese came first in 1509 to Ayutthaya. They established a trade post outside the city. 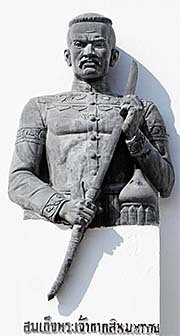 Portuguese mercenaries fought for Ayutthaya against the Burmese and in other campaigns (as well as some of them fought for the Burmese invaders). Spanish envoys came to Ayutthaya in 1598, after the colonization of the Philippines. The Dutch East India Company (VOC) sent envoys to Ayutthaya in 1604, opened a first post here two years later. In 1608 Siamese envoys went to The Hague. 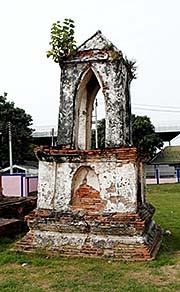 Jeremias van Vliet, representative of the Dutch East India Company and later governor of Malacca, lived for some years until 1642 in Ayutthaya. Van Vliet was also a chronist and made a contribution on the history of Siam. 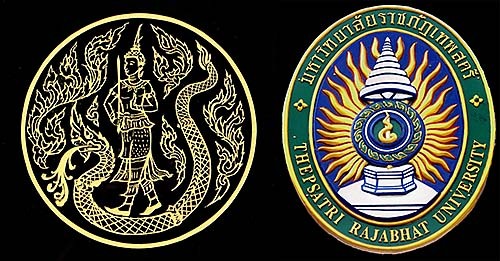 'Journal of the Siam Society' and 'Short History of the Kings of Siam' are two of his four works on Siam. In the mid 17th century the Dutch East India Company tried to force certain trade monopolies. 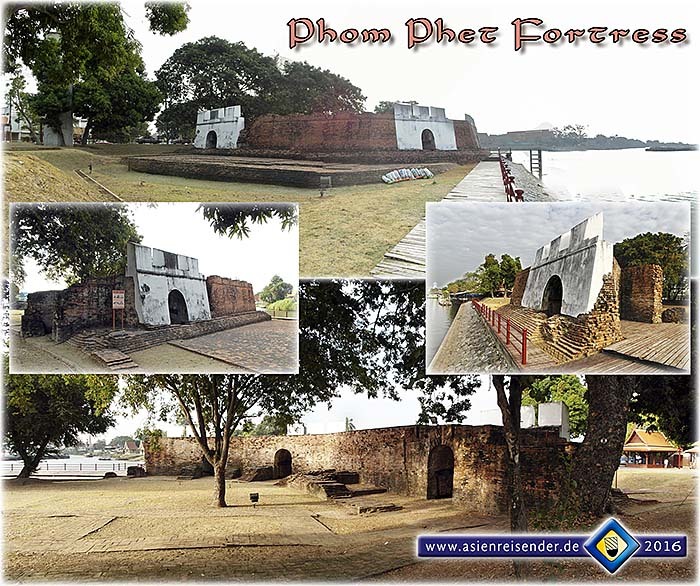 It came to violent conflicts and a Dutch blockade at the mouth of the Chao Phraya River in 1663/64. The Dutch gained privileged trade rights in Siam. Also the French East India Company was active here from 1664 on and established for a time a good relationship with Ayutthaya. After 1680 there were several diplomatic missions of Siamese envoys to Paris. The French were for a few years the favourite European power. 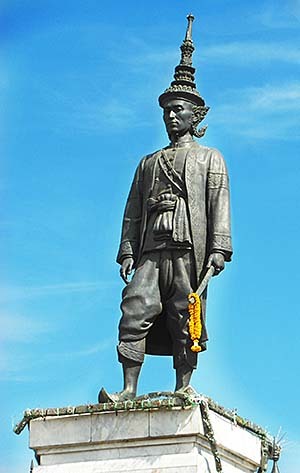 Siamese king Narai promoted the Greek adventurer Constantine Phaulcon, who came first for the British East India Company to Mergui, and changed later working for the French, to his personal language interpreter and minister. It's supposed that Phaulcon designed the 'Ban Vichayen' complex in Lopburi, where he and other French envoys lived in luxury close to king Narai's Palace. The rivaltry between the European powers led to a retreat of the Dutch. 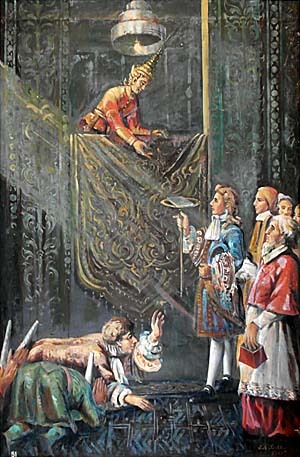 Though, finally the French demand for the erection of fortifications and the activities of Catholic missionaries made the Siamese high nobility under the leadership of the later king Phetracha suspicious. They suspected (for very good reasons, I would say) a slow French take-over of Siam as a French colony. In a certain way it's really admirable how the Siamese avoided a western colonization over the centuries. A sickness of king Narai (or rather a poisoning) was followed by a coup de etat in 1688 (the so called 'Siamese Revolution' of 1688). The French and most of the other Europeans were afterwards forced out of the country and in the following time Ayutthaya followed a policy of isolation against European powers. Nevertheless, the trade with the Southeast Asian neighbours as well as with India, Persia, China and Japan still flourished, and the cut-off trade relations to the European powers caused no meaningful loss for the kingdom of Ayutthaya. The European trade with the Siamese was as well estimated little profitable by the Dutch, as a record of Jeremias van Vliet gives witness. Representatives of other Asian powers came of course as well to Ayutthaya. Chinese traders came in a great number. They were free of the obligatory corvee to the king which the Siamese subjects had to obey to - they were not subject to the sakdina system. The Chinese therefore were free to trade and make business. That gave them a strong advantage over the Siamese in this time already, establishing businesses and probably have maintained there strong position in Siam/Thailand's economy until today. Over all the time of Siamese/Thai history there was a permanent flow of immigrants from China to Siam/Thailand. The king of Ayutthaya allowed Japanese to settle down south of the city of Ayutthaya, in neighbourhood to the European settlements out of the city walls. Japanese came for several reasons to Siam. It was a refuge for ronins, Samurais who fled Japan, or for Japanese who practiced Christianity what was not accepted in the Japan of the time. The picture depicts a 19th century replica of a painting in which the royal Japanese guard accompanies a royal procession in Ayutthaya. 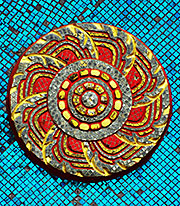 Image by Asienreisender 2012 in the National Museum in Lopburi. Also Japanese came to Siam. 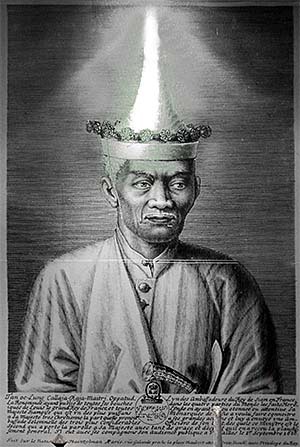 One of them, Yamada Nagamasa, was even promoted as a province governor of Ligor (nowadays Nakhon Si Thammarat) in the south of the empire. 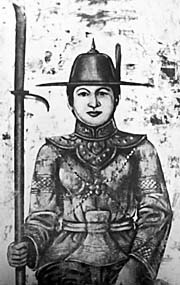 Japanese mercenaries, who settled down in the Japanese quarter southeast of Ayutthaya, might have fought for the Siamese against the Burmese. Up to 1,500 Japanese lived in Ayutthaya until 1630, when a severe conflict brought out and a massacre was committed on the Japanese. The survivers were then banned from Siam. The Siamese expansion to the east deep into Laos and Cambodia from the early 18th century on led to a rivaltry with a new opponent - Vietnam. But the relative weakness of the Siamese king's power in favour for the high nobility made it impossible for the empire to further dominate the conflict with the Vietnamese. Also didn't take Ayutthaya advantage of a weak phase of it's Burmese rivals around 1740 CE. After the death of king Borommakot and the consolidation of a new Burmese dynasty, Burma attacked Ayutthaya again. In 1759 a number of cities controlled by Ayutthaya, among them Mergui, Ratchaburi, Phetchaburi and Suphanburi fell under Burmese rule. 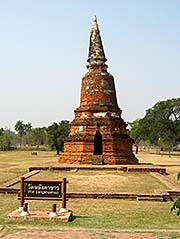 Soon later Ayutthaya was again under a Burmese siege. Due to the loss of their king in an accident with a cannon, the Burmese withdrew. In 1765 Burmese troops came again with two armees from the north and the south. A year later they laid Ayutthaya under another siege, which was lasting a full year. King Ekathat offered surrender, but the Burmese wanted the total destruction of the city. After a devastating fire broke out in the city, many inhabitants fled the place. In the evening of the 7th of April 1767 a part of the city wall fell and the Burmese conquered Ayutthaya eventually. The victors havoced the large city completely. What they could not take with them they destroyed or threw into the river, and took many people, particularly artists and craftsmen, as slaves with them. After more than 400 years of history the place was completely abandoned. No one could live here anymore. The king was dead, his successor as well. Chaos spread out. Provinces declared independence. Whereever the Burmese army went, they destroyed what they could and killed or enslaved the local people. They came again and again in the following years and even over decades. What was just short before the greatest empire in Indochina, fell now into total chaos. Parts of central and completely north Thailand became depopulated. In around 1800 nobody lived in Chiang Mai anymore. Who could escape, escaped into the forests and mountains, where organized armies can not fight in a regular way. However, the downfall of Ayutthaya was possible by a great deal due to internal strife. The permanent competition among the nobility and their ambition to gain the throne weakend the kingdom over times, and that was so in the mid 18th century. That would have been almost the end for Siamese/Thai history. Nevertheless, despite all the chaos a Siamese general, Paya Taksin, reorganized what was left, gathered troops and supporters and founded a new capital at Thonburi, a small settlement at the lower Chao Phraya River, some sixty kilometers apart from Ayutthaya. That was the very beginning of the history of modern Siam/Thailand which lasts until today. Ayutthaya's emerging power made it one of the strongest states in Southeast Asia already about half a century after it's foundation, around 1400. This power was mainly based on the growing manpower of the kingdom. Since there was practically no technical advance in premodern Southeast Asia, the states who competed with each other had to gather as many men for the two purposes of labour and war. Other resources played a secondary role, like the number of working and war elephants who could be mobilized, but manpower remained the key factor. For the year 1600 CE the estimated population of Ayutthaya city and surroundings is estimated of 300,000 people, a century later, around 1700 CE, it's estimated of 1,000,000. That does not include the populations of vassal states. As in any other Oriental despoty, the social stratification was extremely hierarchical and based on ideology like Buddhism, the concept of devaraja (the divine king) and intimidation by coercion. Unlike in the western modernity, where the human material is administrated by and depending on abstract institutions, the feudal system made inferiors depending on superiors like officials and noblemen, in an increasing rank. Both systems were/are systems of total social control, exploiting human labour. 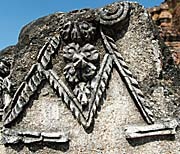 Simon de la Loubere, Jeremias van Vliet and other Western visitors of Ayutthaya described the social organization of Ayutthaya; commoners had to work for six months or more for their superior, or to improve the state infrastructure, or to serve in the army. Anyone in the state was under control of a superior, while at the very top of the social pyramid stood always the king, who had the highest authority in anything, including the deployment of the workforces. The widespread idea that 'Thai' means 'free' is insofar a myth as it was never covering the social truth in the Siamese states in past and present; if the Thai People were ever 'free', then it was before the establishment of feudal city states or as escapees into the mountains, living a live apart from the civilized centers as hill tribes. 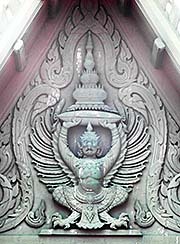 The official headdress of the court officials in Ayutthaya was the lomphok. It's a spiral formed turban, probably a derivate from models of the Persian court. Rings of decoratons indicated the rank of the official. Buddhism was used as an ideological mean of legitimation and strenghtening the power of the king. In the reign of king Borommatrailokkanat (1448-88, in short king Trailok), an enforcement of the social order was implemented, known as 'sakdina'. The rank of any person in the kingdom was expressed in a numerical equivalent. These scores were not only meant to allocate a certain amount of land to any person but, moreover, a certain workforce. Social status was expressed by the number of people over one had control. Generally, the Siamese society was divided into five main classes: the royal family, the nobility and the state officials, the clergy, the commoners and the slaves. Chinese, other Asian foreigners and Westerners stood outside the system and were taxed differently. The godking himself stood above the system; the highest rank inhabited the crownprince, who was granted with a 100,000 sakdina points. Royal family members got 50,000 each, and nobles out of the royal family ranked between 10,000 to 400 points. State officials gained 400 to 50 points, artisans 50, commoners 25. A slave was 5 sakdina points worth. The lowest rank of all in the sakdina system were unmarried peasant women, who got no point at all, ranking insofar below the slaves. Unlike the system of estate in feudal Europe, sakdina and social rank weren't hereditary. An official who lost his post as such lost also his sakdina points as such. Also the nobility gained their status due to merit. The bulk of the workforce was called the 'phrai'. Phrai were all the commoners who were in the age between 18 and 60 years. They were obliged to register at a nai, a feudal patron. 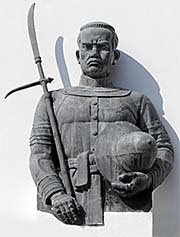 The phrai were diverted into different kinds, as the royal phrai, private phrai, prisoners of war, military or civil phrai, Thais, Khmers, Laotians, Malays or Mon. Most of them were peasants. Their sakdina ranked between 10 and 350. The nai were directly ruling over the phrai and responsible for jurisdiction, taxation, forced labour, but also care. The phrai got a tatoo on the lower arm, an inscription of his name, origin and the identification of his nai. It is estimated that in the Siam of 1850 (already post-Ayutthaya, Rattanakosin Era) between 50% and 90% of the population were slaves, the vast majority of the remaining population were phrai. The higher ranks of officials and nobility was merely a small split of the total population. The clergy consisted in the high ranks of noblemen and retired officials. The dominant religion was already theravada Buddhism, as it is still today. Many commoners became monks; slaves couldn't join a monastery. 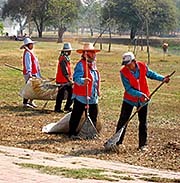 Buddhist monks weren't obliged to corvee labour or to serve in the military. It was already a custom that any Siamese man would spend a certain time, a few weeks or months, as a novice monk in a temple, as it is still today. The temples and monasteries, of who were many, were the only educational institutions for the commoners. Education was about morals and Buddhist values. Languages like Sanskrit and Pali were certainly not often learned by commoners. In some cases astrology, medicine and kind of natural sciences were part of the education. The first Thai schoolbook, the Chindamani, was edited by a monk named Horathibodi in the reign of king Narai (1656 - 1688). Crafts weren't learned in schools but in practice, all of it in oral tradition. After the conquest of Angkor Thom, a number of Brahmans from Angkor came to Ayutthaya. Unlike in Angkor, they never gained much of an influence in the Siamese state, although they played a role in some royal ceremonies. 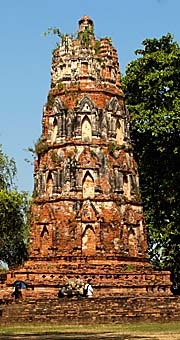 However, many of the Brahmin customs played (and still play) a certain role in Ayutthaya. In old scripts are multiple ghosts and spirits mentioned as well as supernatural phenomenons. Amulets, tatoos, special exercises and metal pieces under the skin were believed to give supernatural powers to the bearer. Astrologers and protective spirits played a role in decision making in military campaigns. All the foreign missions targeting missionary aims like Islamization from Persian missionaries or Christianization efforts from French priests remained widely successless. 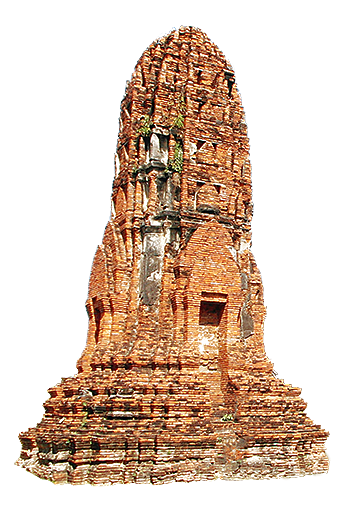 After the 'Siamese Palace Revolution' of 1688 it came to a persecution of Christians, of who lived about 2,000 in Ayutthaya. 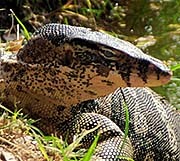 It remained a unique appearance in the history of Siam/Thailand and has to be seen as a protective action against Western colonial ambitions. Still today sakdina plays an important role in Thai society, making anyone different from anyone else. Even twin siblings are unequal insofar as the firstborn ranks higher than the second born. The extreme extension of status thinking in Southeast Asian populations in general, in Thai society in particular, roots out of this traditional social stratification. Still today, different social classes are diverted by language and vocabulary, clothing and social customs. In the royal court of Thailand, a specific court language (rajasap) is spoken. Children already learn how to behave towards lower or higher positioned members of Thai society. ...is one of the spoiled places in Thailand. It's one on the, if not THE cultural hotspot of a MUST GO in Thailand. So, it's promoted in all of the tourist guides, and a lot of tourists, usually bus loads of them, are brought here - many of them pay here their first visit to Thailand. They don't know anything about the country, are impressed by the strangeness and exotic of the surroundings and the politeness of the Thai People. Prices seem to be cheap, compared to the countries where they are coming from. All that makes them the perfect victims for all the frauds going on here. On the first glance it's clear here that the local guesthouse owners only have the dollar symbol in their eyes. They are pushy and want to make business only. There is no genuine friendliness here. Tourists are here to spend money, nothing else. They are human material, of course, as people are for any industry. Interest in history and culture means nothing for neither the Western tourists nor the local touts and business owners. That's no value. None of the Thai People here care for history. They only have their businesses to run. Also notorious 'Lonely Planet', (here I refer to the latest edition 'Thailand 2012'), suggests it's readers above all to visit some markets, buy some this and that and then make an elephant tour - organised by, what else - a tourist company. So, by the way, don't expect it being cheap here - at least not for Thai relations. Nevertheless, when you are a bit experienced in travelling and aware of what's going on, you can still stay here for 'little money' and get a look on of what makes the site an interesting place. When a Westerner want's to enter a local sight, he has to pay at the ticket booth. The fee for a foreigner is written in English. It's always, that's a pattern, five times as much as a Thai has to pay to enter the site. The price for Thais is written in Thai - that's not only a certain script for letters, unreadable for most of the foreigners, but it's also a Thai script for figures. Foreigners normally don't realize the difference. So, a Thai visitor pays 30 baht, a foreigner pays 150. And that add's up, because there are many sights around and one has to pay all the time again and again. Some Westerners frequently argue at this point that, 'of course', Westerners would earn much more money and can afford the price. They are so brainwashed to accept annoyances and injustices of all kind, that they themselve invent stupid excuses for being discriminated. The Thai authorities have nothing less in mind than to implement a compensation for an income gap between foreigners and Thai People. They see foreigners as a more profitable source to milk, that's all. Besides it's not at all so that Thai People nowadays earn less than Westerners. Contemporary Thailand is a rich country. There is an emerging middle-class here who have successfull buisnesses running. They make a lot of money and can cope with the declining western middle-classes. They go to historical sites for reasons of national pride and status, not for educational purposes. They have no, false, distorted or only faint ideas about history; ask them what you want, the answers are generally devastating. They believe in mere ideology, stereotypes and superstition. The poor people of Thailand therefore don't go into museums and historical sites. They are not interested at all in culture and history but run their small businesses. Some also might make more money than one would expect. So, what's the point? It's just a mean of discrimination of foreigners to charge people from non-ASEAN states more money than others. It's one of the acquisitions of modernity that all people shall be treated as equals. Imagine that in a western country. Everybody has to pay, let's say, two dollars entrance for whatever, but people from Thailand, Malaysia, Indonesia, Cambodia, Laos, Vietnam and so on have to pay ten dollars. Unthinkable. In Southeast Asia, in reverse, it's normal, everywhere. Not only in Thailand. It doesn't matter if one arrives on the bus or train here - after arrival the traveller sticks first in the east of Ayutthaya, what is the worst part of the place. First it's really dirty, second there is so much traffic that one can barely look much around but has well to care for his physical integrity. Don't get hit by a car or motorbike! Not to speak of the terrible noise that doesn't allow communication to others, the smog and the block of sight which is done by the huge cars all around. It's stress here, and to go here despite all the nuisances provides a deeper interest in the place and it's background and the will to cope with all the annoyances. Not to forget: there are masses of dogs here. Masses of dogs around! When I went into Wat Suwan Dararam I was attacked by dogs. Ten, fifteen, and more dogs came when hearing the noises of their cronies. I couldn't believe it, more than twenty dog's came eventually, some of them big and really aggressive. The beasts become most brave when appearing in big packs. 'That's really serious', I thought, having been alone, and tried to scare them away by waving with my bicycle, my back covered by a wall. After a short time, fortunately a monk came out of a sidebuilding, equipped with a stick and helped me to get out. When I went further around in Ayutthaya with the bike, I saw dogs everywhere, but at least there was no second experience like that. Alone when arriving at the railway station one sees a good number of dogs being around there as a kind of welcome. By the way: temple dogs are among the worst dogs in the Buddhist countries of Southeast Asia. 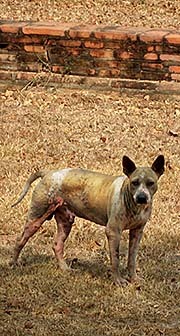 Bad dogs are clearly one of the downsides of Thailand.